Don’t believe all the hype: Sarah Ashwood isn’t really a gladiator, a Highlander, an expert fencer, a skilled horsewoman, an archer, a magic wielder, or a martial arts expert. That’s only in her mind. In real life, she’s a genuine Okie from Muskogee who holds a B.A. 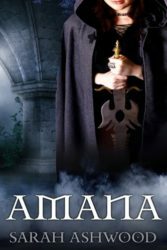 in English from American Military University, and is the author of the Sunset Lands Beyond fantasy trilogy, Amana, A Minstrel’s Musings, and more than 37 works published in a wide variety of anthologies, magazines, and webzines. She lives (mostly) quietly at home with her husband and three sons, where she tries to sneak in a daily workout or run to save her sanity. Now… on to the six questions! If you have any questions of your own, please leave them in the comments, and hopefully Sarah will drop by and answer them. I consider four of the biggest accomplishments in my life so far to be surviving pregnancy and natural childbirth three times (I have very difficult pregnancies, and natural childbirth is no joke! ); writing my first novel, which took over a year for just the rough draft, then several more to edit and re-edit and re-edit; earning my B.A. with intermittent work over the course of twelve years; and lastly running two half-marathons. All four of these required months, if not years, of hard work and/or discipline and training, but the finished product—the babies, the finisher’s medals, the diploma, and the books—were so worth my time, effort, and energy! I’d written short stories off and on for years as a kid, but when I was eighteen (I won’t say how many years ago that was) and began the rough draft of Aerisia, it was the story that I didn’t put down until it was finished. My Sunset Lands Beyond trilogy was originally written as one looooong book, but I divided it into three novels. The time between starting the rough draft, multiple edits, separating the novels, and finally publishing them was well over ten years. This is hard for me to answer, because I am not a planner when it comes to writing! I will jot down a very, very rough “outline” that is more like a random collection of characters and events I want to include in my book that are only loosely connected. If anyone except me were to read them they’d probably think they were the ravings of a lunatic. Somehow, it all comes together as I put it down on paper. If I have to do any research, I will jot down my notes in the same folder as my outline. It’s funny that my process isn’t any more organized than this, because I am a type A personality and tend to be very structured in other areas of life! I would love to see Julie Kagawas’s “Iron Fey” series brought to life, but they would have to pick the right actors to match my mental versions of the book characters. To me, Ash is very much an Orlando Bloom-Legolas type, which would be pretty easy, since we have the example of Legolas already on film. Puck would be the hard one. I think he’s hilarious and devious and sneaky all at the same time; that might be difficult to translate to film. And a magic wielder’s hand? Fairies, dragons, immortal warriors (not immortal like Tolkien’s Elves; the Simathe in Aerisia actually can’t be killed), giants, phantasms, and an average American girl… These are a few ingredients of the Sunset Lands Beyond trilogy, an epic fantasy series featuring fairytale elements to make it unique. 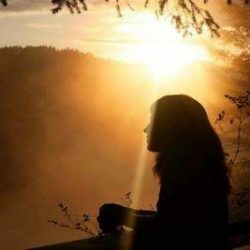 If you enjoy a classic struggle between good and evil, with an undercurrent of romance and an average young woman struggling to figure out both herself and her destiny, my Sunset Lands Beyond trilogy is definitely for you. 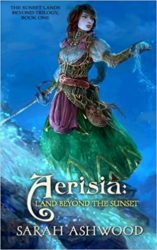 Pick up a copy of Book 1, Aerisia: Land Beyond the Sunset, and prepare to escape into the magic beyond the sunset!